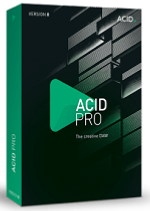 Introducing the all-new ACID Pro 8. This is the latestversion of the software that launched loop-based music production over 20 yearsago and is packed full of contemporary and pro-level features for today'screative artists and producers. Powerful 64-bit technology sits behind a newinterface that maintains ACID Pro's famed easy workflow. Dozens of newinstruments, loops and effects line up with 12 GB of brand new content to giveyou everything you need to create music in any genre. With VST3 support comingsoon in a free update, ACID Pro is future proof and ready to embrace a newworld of plug-ins. ACID Pro 8 is software reborn for 21st century audio production:With more features, more power and more plug-ins – all with the sameeasy-to-use workflow.